The spotlight shines brightly on a young woman twisting and twirling on a silk threaded to the high ceiling. The crowd gasps with each feat, and when the woman flips to the floor, the crowd roars into a standing ovation. Although the techniques she uses on the aerial silks to literally dance in the air are modernistic, the concept and practice behind air performances are not. As early as 2000 BC, Minoan culture featured depictions of acrobats in art and on murals. The feats did not take place in a circus tent with a high ceiling, but rather, on the backs of running bulls. Similar depictions can also be found in Greek and Egyptian art. However, rather for performance sake or entertainment sake, these feats were predominantly part of religious festivals. The earliest acrobatic troupes are documented as being established in China around 500 BC. By the onset of the Han Dynasty, acrobatics had transformed from dangerous displays on the backs of running animals to rope walking, pole climbing, and cultural performances, such as fish turned into dragons, and five tables. These troupes were often compiled of everyday people and peasants who incorporated tables, chairs, ladders, jars, plates, and bowls into their acts. However, these troupes performed, as they traveled through towns, on street corners and in town centers, not in an official building. The beginning of modern circuses can be traced back to Roman times, such as the Circus Maximus in Rome. Originally, a circus was a building used for exhibition performance. These large buildings often featured chariot races, equestrian shows, jugglers, and acrobats. During this period of Roman superiority, the Roman roads and controlled environments under the Roman Empire made it possible for families of performers to travel throughout Europe and display their skills. At this time, the classic idea of circus skills being passed from parents to their children was also developed, and it paved the way for family-centric circuses of today. Acts such as juggling, singing, trained animals, and dramas were added into medieval performances. In the late 1700s, the first modern Three Ring Circus evolved under Philip Astley, a circus owner who introduced a ring into his tent to circumscribe the area in which an equestrian and their horse could perform their tricks. Today’s modern ring is 42 feet wide, which is the area a horse needs to comfortably gallop. However, this was also the time when aerial aerobics began to develop past their ancient ancestors and new events such as suspension on ropes, slings, and ribbons, as well as the trapeze joined the classic tightrope acts. Without question, the trapeze was the jumping point for most aerial acts after its creation. Originally made from rope with a wooden or metal bar, the trapeze and the fear of falling combined with the audience’s excitement quickly paved the way for later developments, such as the flying trapeze. First invented by Jules Leotard, a Frenchman, Leotard developed the popular idea of handing two trapeze bars several feet apart and taught himself to jump and swing between the bars. He practiced this technique over a swimming pool in his father’s gymnasium, and was ultimately invited to perform at the Cirque Napoleon in Paris, France, in 1859. Leotard’s innovative flying and swinging system quickly led to progressively more brave and dangerous acts, where performers were suspended in the air by their hair, plaster casts set into their mouths, or even by their own strength as they were pulled into the air holding onto two rings, and then proceeded to flip and maneuver high above the crowd. 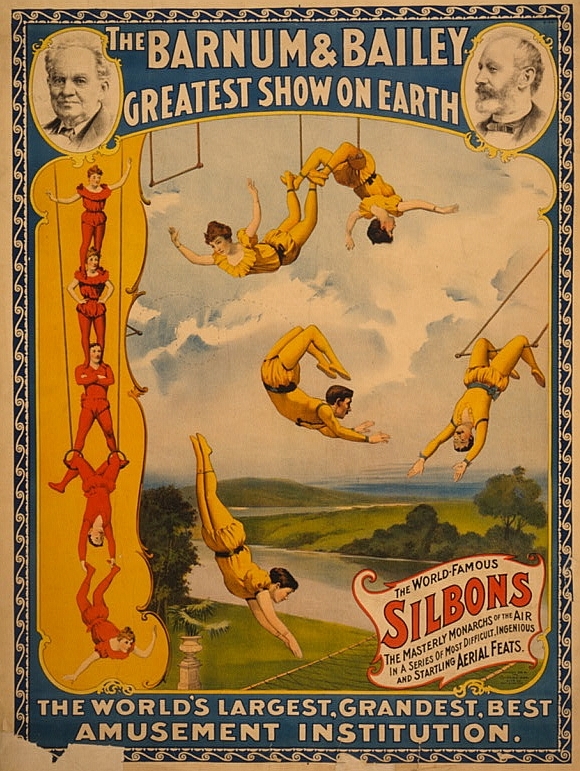 Aerial performances have since been dominated by the United States, beginning with the Philadelphia Circus in 1792, which was created by John Bill Ricketts. Ricketts circus churned out new ideas such as using a canvas tent for performances. Quickly following Ricketts success, PT Barnum and William Cameron Coup introduced a sideshow, a train system to transport their show from town to town, and the three ring circus. These constant changes and upgrades, as well as the family-centric circus system encouraged families, such as the Wallenda family, to peruse aerial fame. Perhaps one of the most progressive performers, Karl Wallenda began performing aerial tricks in his teens. In 1922, Wallenda created his own act, which featured his brother and future wife. The Wallendas shot to fame by performing a high wire stunt at Madison Square Garden in New York, but did so without a net since theirs had been lost in transit. Karl performed until his death, which resulted from falling off a high wire in San Juan, Puerto Rico, during as an exhibition, but his death was avenged when his son, Rick Wallenda, later completed the walk. Not to be outdone, another one of Karl’s family members, Angel Wallenda, lost her right leg and pieces of her lungs to cancer, and made history as the first tight rope walker to perform with an artificial leg. Members of the Wallenda family still perform today. More recently, increasing concern for animals working in circuses have forced owners and performers to turn to new acts to maintain their audience, hence, the continual development of aerial acts, such as those famously performed by Cirque Du Soleil and Cirque Noir. Today’s performances have greatly evolved from the balancing acts of the past. The latest addition to aerial performances is aerial silks. The silks are anchored by ball bearings to the ceiling to prevent binding while still allowing the performer to twist and turn as needed. Although the acts originated with safety nets and wires, the act has transformed into a display and strength and agility while dangling in the air and always having the possibility of falling to your death. Aerial silks have even progressed from circus performances and Vegas shows to a workout that is available for beginners through classes. From adventurous bull-riding to the invention of the trapeze and tight rope to aerial silks, the evolution of circus aerial performances have transformed and recreated what we thought humans were previously capable of, while inventing leotards, circus tents, and a new workout method on the way. Elyssa May Szkirpan was born in Webster, Texas in 1993. She spent most of her childhood between Chicago, Illinois and Tulsa, Oklahoma. She is currently a Professional Writing major at the University of Oklahoma and has aspirations of becoming a language teacher after graduation in 2014. This entry was posted in Uncategorized and tagged acrobates, aerial performance, aerial silks, circus, circus acts, circus performers, circus sideshow, freaks, sideshow, sideshow freaks, sideshow performer, three ring circus, trapeze. Bookmark the permalink.